Home inspectors are occasionally subpoenaed to appear in court, to produce evidence required for some civil action, or to give witness or expert testimony during a trial or outside of court at a deposition. The reasons for the summons can include being sued by a former client, being asked to provide an expert opinion following an unsatisfactory repair or an inspection by a different inspector, and other reasons. 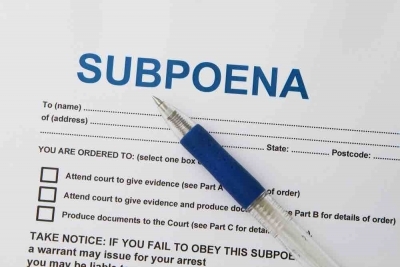 Here are some facts about subpoenas that can make the situation less bewildering and stressful. Although similar, there are some basic differences between a summons and a subpoena. A summons is issued by a court and signed by a judge, and notifies you that a lawsuit has been filed against you. It will include the name of the issuing court, the name of the plaintiff who filed the suit, and a court case number. It will also include the details about why you’re being sued. It may not include any instructions beyond a date by which you, as the defendant or respondent, must respond. A summons is typically mailed via certified mail, which requires you to sign a postal service receipt that indicates that you accepted it. It can also be served on you in person. If you receive a summons, contact your attorney immediately for next steps. A subpoena requires you to either appear to testify or produce items that are being requested by a party to a lawsuit. It contains the same elements that a summons does, and can be either mailed to you via certified mail, or personally served on you. There are two types of subpoenas. A subpoena ad testificandum (or simply subpoena) is a demand that the recipient testify in court. The other type of subpoena is a demand for physical evidence, which is called a subpoena duces tecum. The subpoena must include the name of the court it was issued by. It should have a title or case name of the action. It should have a civil action or docket number. The subpoena instructs the party it is issued to with a specific time and place to either appear to testify or to provide whatever files, paperwork, or objects are requested as evidence. The contents of the subpoena are filled out by the party requesting it. A valid subpoena originates from the court where the legal action is proceeding, and is signed by the court’s clerk or an attorney licensed by that court. The service of a subpoena has its own requirements, although who, where and how you can be served varies. As discussed, a subpoena can arrive via certified mail, requiring you to sign a receipt for its delivery. It’s common to be served in person. Anyone at least 18 years of age can be a private process server. The process server cannot be a party to the lawsuit or legal action, nor can that person be a signatory to the subpoena. A deputy sheriff can also serve the subpoena. When you’re served, you may be asked by the process server for your signature to indicate proof of service and that you’ve accepted the subpoena. You can refuse to sign, and the process server will simply indicate this on their form. Declining to sign the proof of service will have no bearing on whether you must appear or produce evidence. If you believe you’ve been served improperly, you can let your attorney or the judge presiding over the case know about it. But be aware that private process servers can be very tenacious, as their fee depends on their success. Under rare circumstances, the subpoena for your appearance may have been issued by a federal office or agency. Generally speaking, most lawsuits are civil in nature and between two private parties. There are some requirements related to the physical location for a subpoena issued for an appearance. The person subpoenaed has to reside, be employed, or conduct regular business in the same state as the issuing court. If the person is a party to the lawsuit and living or working within 100 miles of the court, and travelling would not cause a substantial expense, that person can be required to appear. If you’re appearing as a witness rather than as a defendant, there should be some accompanying document indicating a fee for your time and reimbursement for mileage. If you’re testifying on behalf of one of the parties as an expert witness, you get to set your own fee and mileage. If you’re testifying as an expert witness at a venue outside of court, you may also be able to negotiate when you can appear. If the subpoena is for evidence, the location it needs to be brought to must be within 100 miles of where the evidence is normally kept or stored. If documents are requested, they have to be presented as they are kept in the regular course of business. Otherwise, they have to be labeled as corresponding to the demand. If electronic files are demanded, they should be produced in the form that they are normally maintained. There are some rules protecting those being subpoenaed. If the person responsible for service creates some undue burden, it may be cause for a sanction of the party who requested the subpoena. If commanded to produce materials to be used as evidence, the subpoenaed party does not need to make a personal appearance, either in court or at a hearing, or at the location where the materials should be taken to, as long as the materials themselves are presented. If there’s some objection to producing such materials, the person who’s been subpoenaed can serve that objection on the party or attorney who issued the original subpoena before the materials are supposed to be presented, or within 14 days of original service. In unusual instances, a home inspector may want to withhold producing information because it’s sensitive. If that’s the situation, you’ll need to expressly say that it’s sensitive and describe the nature of the material without revealing the sensitive information. If you provide sensitive information as demanded by the subpoena, a claim of privilege or protection can also be made by notifying anyone who has received the information, who must then return or destroy the information, or sequester it until the issue is resolved. In addition to Rule 45 of the Federal Rules of Civil Procedure, you or your attorney should check for statutes relating to subpoenas. If there’s a problem with the subpoena for any reason, or if it poses an unreasonable burden, does not provide sufficient time to comply, or would disclose privileged information, trade secrets, or confidential research, or if it requests expert testimony that is not related to the case or was not asked for, the subpoena can, in some cases, be quashed (revoked) or modified by the court that issued it. In such a situation, a motion should be filed with the issuing court requesting some action that will countermand the subpoena. This motion must be granted and signed by the judge, or the subpoenaed party must comply with the original subpoena to avoid being found in contempt of court, which will carry some type of penalty. You may be issued a Notice to Show Cause first, but it may not be successful. In all situations, if you’ve been served with a summons or a subpoena, contact your attorney so that you can prepare a response and, if necessary, mount a defense. If you have any questions, email InterNACHI’s Legal Team at legal@internachi.org.